BELGRADE — Serbian Orthodox Patriarch Irinej called for unity among Serbs, adding that the Church (SPC) would never agree or come to terms with Kosovo “being given away”. Irinej called on the people to be united in politics and everything else, because the Serbs are a small people and the only way to survive was through unity and some values the world would understand and support. “It is unrealistic to us, and I think the Serbs and the SPC, which has always been with the people, will never agree to what can be read in the press nowadays – ‘a civilized surrender of Kosovo’,” he told Tanjug in an interview on Wednesday. No one in the world has ever done something like that and called it civilized, Irinej noted, adding that it was well known how territories were taken and conquered – through war and force. The Serbs do not see Kosovo as a geographical area, but as holy ground, he stressed, adding that it was also the view of the SPC Holy Assembly of Bishops. 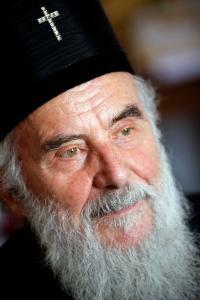 The holy sites in Kosovo are not from yesterday, but have been there for centuries, he noted. “And finally, the patriarchal residence is in the Peć Patriarchate (in western Kosovo), which means the residence would, according to that logic, be in another country,” he remarked. He fears that some day, when there is no military force in Kosovo, Serbs will not be able to survive. “Everything has been done to make survival impossible for what few Serbs have returned. The murders (of Serbs) that are happening were conceived to intimidate them into leaving their homes,” the patriarch believes. He said the SPC was interested in the survival of the Serbs, especially in the Kosovo enclaves, and in what would happen to (Serb Orthodox monastery) Dečani and other churches and monasteries, many of which had been set fire to, adding that some were under UN protection.